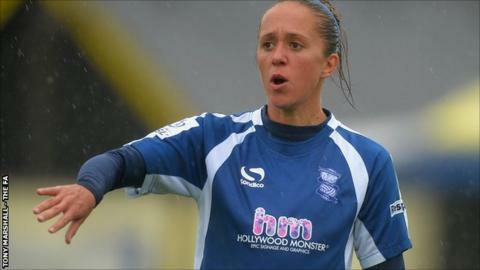 Birmingham City stunned Women's Super League One leaders Chelsea on Sunday to reach the semi-finals of the Continental Cup. Home captain Karen Carney had the best chance of a goalless first half but her volley was saved by Hedvig Lindahl. Jo Potter's curling free-kick put the hosts ahead shortly after half-time. Chelsea were unable to respond and defeat ended their hopes of winning a domestic treble this season. After a slow start, the visitors ended the first half the stronger, and City keeper Sophie Baggaley did well to turn Gemma Davison's low shot around her near post, before Millie Bright's dipping effort went narrowly over the bar. Chelsea Ladies beat Birmingham City 4-0 at home in the league only last month. Two-time finalists Birmingham took the lead after the break when Potter found the top corner with an expertly-taken direct free-kick. South Korea international forward Ji So-Yun saw her shot blocked as Birmingham defended in numbers, and Hannah Blundell's effort was deflected wide. David Parker's side are now unbeaten in their last six games in all competitions and have won seven of their last nine. "It was a top-class display from our side. I think that we were definitely the better side throughout the game. "We know how good Chelsea are going forward, their front four is magnificent, and we had stop them where we thought their strengths were. "All week I did think we'd beat Chelsea, so that's where we think this group are." "Credit to Birmingham today. They deserve that win. "If you're up there with the best, you've got to accept that pressure. I don't think pressure affected us today. "Don't take the credit away from Birmingham. They were the better team and they deserve to get into a semi-final." Birmingham City: Baggaley, Carter, Mannion, Harrop, Allen, Linnett, Carter (c), Potter, Lawley, Westwood, Windell. Subs not used: Sargeant, Ayisi, Wellings, Torkildsen, Haines, Peplow. Chelsea: Lindahl, Blundell, Bright (Spence 64), Flaherty (c), Fahey, Davison, Aluko (Ayane 80), Ji, Kirby, Borges, Coombs. Subs not used: Chapman, Brett, Kitching.